She looks fantastic! Fun interpretation here! Mow that is Foxy Lady. Hope she had a most excellent evening. 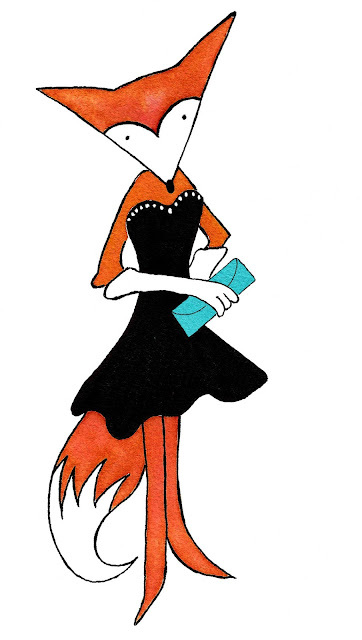 mrs. fox is very elegant. I like her dress and the way her tail ends in white. great take on the theme. Such great illustration - I love your take on Ms. Fox - she really looks ready for a night on the town in her strapless dress and long gloves! What a fun interpretation adn twist on the theme a bit. I LOVE it, Sue. I hope her Mr. Fox treats her well. Great job adn good to see you here too. Thank you. That is delightful Sue. I love the triangle face, and her clothes. Well done. Such a stylish foxy lady! Quite the foxy fox there!